HarapekoDoggyBag Bloggy: The more the better!! 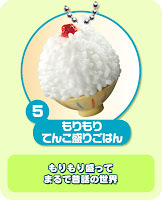 Re-ment (Rement) 2009: Omori Food Mascot #5. "Mori mori tenko omori gohan" or "a mega big helping of rice"
"Mori mori motte marude mukashi banashi no sekai" or "unfathomable monster size rice that echoes the monster size things told in old Japanese fairy tales"
The omori katsu size in a Nara Restaurant! Omori curry and rice & omori soba noodles! Whether or not the Japanese economy is up or down, it's easy to find an eatery where you can double up on your food serving. 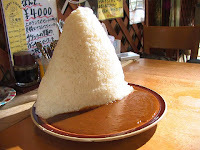 Heck.... don't just go for a 'hill' size portion, you can plunge right in and go for a 'mountain' sized serving. The word 'omori / お盛' next to the dish name, for example 'omori gohan or rice' usually denotes the larger than average serving that will entail once you order. So you might think that 'family' size is small in Japan, well think again! 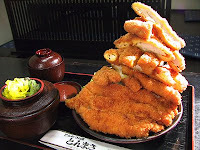 If you are ever in Japan, visit Nara Prefecture, here you can see deer and eat the biggest katsu or fried pork.